During my short career as a physical therapist, I have pretty much every comment from patients about their HEP, including "I'm too busy," "I'm too tired," " I have pain," "I forgot," or simply "I don't want to do them." These are some of the reasons why people do not perform their home exercise programs (HEPs). The reasons provided give a small glimpse of how much of physical therapy involves changing patients' behavior. The important thing that a physical therapist can do at this stage is not to blame the patients and to understand that all exercise behavior change is difficult. PTs alone are not going to make their patients better, but physical therapists have the opportunity to teach patients how to make themselves better (Miller, 2015). In my experience, patients who are not only compliant, but also adherent, to their prescribed home exercise program tend to progress and recover much more quickly than patients who don't do anything outside the clinic. This reduces the time and money spent attending supervised physical therapy sessions ("Importance of home exercise program", 2008). Patient compliance is of considerable importance in physical therapy because treatment effects partly depend on it. The efficacy of therapeutic exercises can only be established when patients comply with the exercise regimen. There are indications that noncompliance with exercise regimens is as great as noncompliance with other medical regimens. The development of methods for improving patients' compliance requires insight into factors that are related to noncompliance in physical therapy (Sluijs et al., 1993). According to Slujis et al. (1993), when health care providers give unclear instructions and fail to explain the rationale for the instructions, unintended noncompliance can arise from forgetting or misinterpretation. From my experience, physical therapists typically provide home exercise programs (HEPs) in the form of written instructions with diagrams and/or verbal instructions with demonstrations. Many HEP software programs are antiquated and/or incomplete, as clinics have to balance the financial costs of upgrading software with declining reimbursement rates and other challenges. Furthermore, different learning styles require that a therapist select the ideal method to deliver HEPs. Clear descriptions of how to perform exercises correctly is critical to the success of any exercise program. Perfecting this skill will make you a better physical therapist and is often a tough specific exercise programs for their patients. BPMRx is a physical therapy home exercise software program that includes access to all modules (cardio, barbell, kettlebells, stretches, etc.). PTs can build unique exercise handouts from a library of hundreds of beautifully rendered black and white illustrations. PTs can create up to 100 different exercise handouts per day on a single account. A PT can email a PDF to a patient's computer or smart phone at no extra cost. The plan costs $10.00/month. Exercise Pro Live provides personalized video exercise programs, patient communications and adherence tracking. It is a patient engagement platform that enhances the relationship between physical therapists and other health professionals and their patients. 3,000 High definition web video exercises. Videos include orthopedic, fitness, pilates, yoga, aquatics, neuro, balance, geriatric, women’s health and more. Fast and flexible exercise search engine. Exercise Pro Live allows the clinician to add their own exercises in real time and are able to brand with the company logo. There is a client portal which facilitates conversation between the client and the clinician along with providing an area for discussion and review. There also includes software that tracks if a patient viewed the exercises and a checklist for the patient to guide them through the protocol of exercises. Click here for pricing. 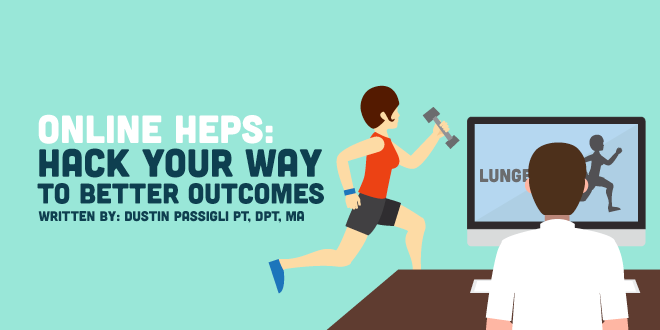 HEP2Go is a home exercise database accessible through any online search engine. There are two plans available. The first plan is free and includes access to all content. You can access this content in the form of print or email, and you can create unlimited exercises. The limitation is that you can only save two routines. The second plan costs $4.95/month and includes everything above, as well as the ability to save unlimited routines, share HEP through SMS texting, and other benefits. Exercises are sorted by joint region, education (body mechanics), and special populations such as vestibular, aquatics, and neurologic patients. Healigo is a home exercise software program that allows the clinician to prescribe exercises straight to the clients smartphone via a free mobile app. The video above introduces the clinician and client to its usage and benefits. The application also provides a patient dashboard which allows the client to input symptom data and/or other variables to improve interaction and transition from session to session along with changing the program seamlessly. Healigo as partnered with webexercises.com shown below to provide access to over 3,500 exercises. Pricing is $15/month/PT, which includes a 30 day free trial. This is an online HEP database that ranges from $20/month plan (0-50 new patients/month) to $55/month (301+ new patients/month). The database contains nearly 1,000 exercise, activity, and education options. Stretching, mobilizations, range of motion, strengthening, education, equipment and device demonstrations, and more are included. A PT can expect to increase patient compliance and provide better customer service and communication by utilizing the secure, private messaging feature. Each individual patient has secure access to their own portal, where they can access their own HEP, which also includes HD videos. Patient Care HEP is an online software program that was developed by MedBridge as a way for rehab professionals to better connect with their patients. This program includes smart search, custom filter views, fast sorting, and intuitive categories. There is a collection of over 3,000+ exercises in the database. Included is a condition-based 3D animated videos in each program to help your patients better understand their rehabilitation. Each exercise is filmed in HD on a pure white background with multiple camera angles to provide your patients with easy-to-follow instructions. Patients have access to their own portal, where the videos, exercise programs, and condition based videos are easily accessible. Patient Care HEP is part of MedBridge's yearly subscription of $300/year. Physiotec is a web-based home exercise program that covers a wide range of specialized exercises for all types of rehabilitation programs. There are video home exercise programs that are produced in-house. With Physiotec, patients have access to their home exercise programs online through their smart phones, electronic tablets or computers. It's easy for them to play the video of each exercise, see the number of sets and repetitions, as well as access written instructions in Spanish, English and French. Clinicians can print home exercise programs by choosing from 8 different print formats to accommodate patients' needs. The handouts can be printed in color, black and white, or vector (line) formats. Physitrak provides 2,400+ fully narrated clinical exercise videos in HD (or clinicians can upload their own). PTs can prescribe exercises in seconds and track patient outcomes in real-time. Physitrack offers a FREE patient app, called PhysiApp (iOS, Android and web). The program was created by APA physiotherapists and clinical experts from around the world. The cost is $9.99/month for a single clinician, with additional options for larger therapy staffs. PTX is a free web-based exercise database that currently contains over 1,000 physiotherapy exercises appropriate for people with injuries and disabilities. The website primarily consists of exercises aimed at improving strength, flexibility, function, and fitness. Emphasis has been placed on providing exercises that are independent of different philosophical approaches to rehab. Exercises can be searched via different categories, such as condition, exercise type, body part, equipment available, exercise difficulty, age category, and image orientation. Each exercise has an accompanying illustration and photograph. Each exercise has instructions, aims, and precautions written in two formats: one for the patient and one for the practitioner. Allows the clinician to design a home exercise program in either a personalized paper and/or video based format. Website boasts that a clinician can create a HEP in less than 30 seconds. Clinician benefits include: 1,600+ orthopedic exercise videos (and growing), 250+ clinically recommended templates, easily email patient HEP, fastest HEP software on the market, customize, save, and share prescriptions with co-workers, allows more time to be spent with patients, improved professional image, and complete control over product selection, ensuring the patient will receive exactly what you prescribe. The client can access their program through an online portal. Accessible via PC and smartphone. Pricing: Contact the company directly for pricing information. WebExercises® gives clinicians the ability to quickly and easily create concise and personalized exercise programs, selecting from over 3,000 clinically accepted exercises and stretches from all body regions. Instruction sheets can be printed or delivered by email, customized with a specific clinic’s name and logo. With WebExercises®, patients gain a clear understanding of their home exercise programs, promoting more frequent and proper form of all prescribed rehabilitation. A database of exercises is also provided in video form. This program gives clinicians the ability to track and improve compliance, and has the added flexibility of allowing PTs to add their own photos and videos. To help your patients get the most from their treatment, WebPT brings you its exclusive Home Exercise Program. You’ll gain access to an extensive library of videos, photos, line drawings and instructions that you can use to supplement your patients’ home exercises through email access. And if you can’t find what you’re looking for, you can create your own programs and instructions. Increase patient compliance through a multimedia (photo and video) program. Spend more time treating your patients instead of retraining exercises. Email on-the-go patients exercises they can review and complete anytime, anywhere. Access peer-reviewed exercise profiles directly from the patient flowsheet. Customize your own exercise programs and instructions. Price: When you visit the website, you can see a free demo, or sign up for a monthly plan. Update: WebPT is releasing an updated version of their HEP! Stay tuned for NGPT's full review of the new software; in the meantime, check out their product page for more details!